The game started out on Steam Greenlight, which it was voted through in under a day and then went on to become part of Steam's Early Access library, unlike many games under the Early Access label Pixel Piracy felt well-polished and wasn't littered with bugs and problems which is common with Early Access games. With the official release the developer has promised many more future updates to come, which is always great to hear someone continue to support the game after release. EDIT: Since writing this Version 1.1 has already been released to fix the problems users have been having. The game covers many different genres as it possible can being a 2D, side-scrolling, rogue-like, Indie, Pirate game with sandbox and real time strategy elements thrown in there for good measure. Despite being such a mishmash of different genres and gameplay elements, Pixel Piracy manages to pull them all together and produce something great, which stands out from many of the others games within these genres. Captain and picking a voice. Both male and female options are available. The game first caught my eye with it's charming art style and retro sound effects and kept me entertained for hours as I travelled across the vast ocean, creating my own story as I went. The game's initial concepts are simple to understand. After creating your unique world to explore you are tasked with building a small pirate ship, buying food and recruiting more pirates to join you on your quest of sailing across the sea to pillage ships and raid islands for treasure. As you play you create your own story. After choosing a background for you character and your world, you are left to explore and experience all it has to offer. As you hire crew members, level them up and buy them abilities to fit different roles you become attached to them. You can assign different roles such as manning the cannons, boarding enemy ships to fight, fishing to provide food for the crew and even cleaning which involves kicking the poop of the other pirates of the ship and into the water below. As I played I found myself creating a back story for my character. I came up with a story as to why he was out searching the seas for treasure, I thought up ideas for the stories of the different pirates I hired. I could recall the name of each one, as I put hours into levelling up and buying skills and equipment, causing me to cringe in fear as they get close to death during fights. Leaving me feeling like I was on an emotional roller-coaster as I watch my first mate fight courageously and give his life to allow the rest of us to escape back to our ship. I originally played the game whilst it was in Early Access months ago. Back then the game was very simple, explore the map and stay alive. There was no end goal for the game and after recruiting several well trained pirates and stockpiling enough gold to pay their salary and buy enough rum to keep my drunken cohorts happy, I easily ploughed through any opposition that stood in my way. Until I pillaged a Cannon from an enemy ship, the next encounter with some hostile pirates ended with me boarding their ship only to have first mate fire a cannon at the ship bringing it down with me still on board... I always knew he was out to get me! The combat involves two different gameplay types. The first being sword to sword combat in which you and your pirates board an enemy ship and attack and parry each other. The success of each hit and dodge is determined by your skills, which you can increase as you level up, in addition to your weapons and tools. Once you start to encounter harder enemies they can aboard your ship too, so designing a well functioning ship is crucial later on in the game. The second type of combat involves using weapons such as pistols, and even fishing rods to attack enemies from a distance. Once you buy or pillage cannons for your ship you can use them to inflict massive amounts of damage from a long range. You can increase certain skills such as your intelligence, strength and even your luck to better aid you in fights. The randomized bio of your character and other pirates plays a part in how he/she behaves, for example, a pirate that likes to stir up fights between others is more likely to cause problems in which you have to make a choice in how you want to deal with it. If you had asked me what I think of the game back when I first played it I would have told you that it's got the potential to be a breakthrough game as long as it continues to polish out it's content and add new features. Coming back to play it months later, I can already see that the developers have worked hard on adding features and improving the overall gameplay and feel of the game. I originally stopped playing the game when it was clear there was no end goal in sight, causing me to quickly lose interest. There wasn't anything to aim for, nothing to challenge me and my almost maxed out crew had hoarded enough munitions to take down a small army, we were able to kill everything removing any challenge. However now with the official release I find myself playing again to experience the new things and finally try and beat the game and the legendary bosses, that once were only worth bragging rights to fight. defeating legendary pirates to collect pieces of a map leading to treasure. I have yet to play any of the late game content due to how hard the game actually is. One wrong move and your Pirate can end up dead on an enemy's boat as you watch your fellow crew members die before you, which is always a tragic sight. I like the brutal difficulty of the game. Even setting the game play options to easy I still had trouble taking on more than one enemy at a time making it feel like a real challenge. 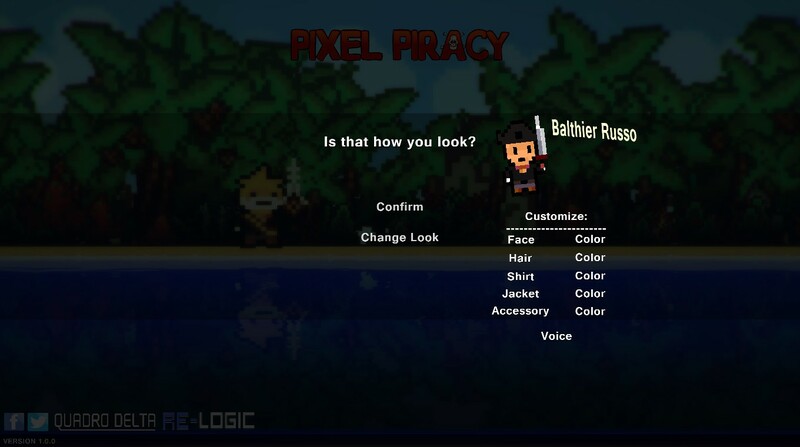 Pixel Piracy was one of the few stand out games within Steam's Early Access. The gameplay is fluid and smooth with an incredible atmosphere, both the sound direction and music is charming and cute as your pirates sing and talk in varying pitches from high and squeaky to deep and menacing, causing even the simplest phrase to be hilarious. 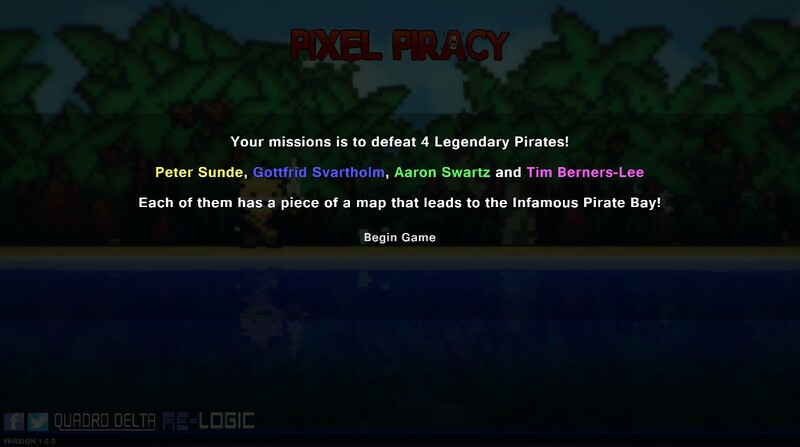 Now that Pixel Piracy is out of Early Access and considered complete, you should defiantly look into it if you think it sounds interesting. With the official release the game is on sale for 50% off it's already cheap price, you have no reason not take a look. You can follow @PixelPiracyGame on Twitter for more news and updates on the game.